Our cake pop boxes are sure to impress. Each pop is stuffed with cake, mixed with Buttercream & dipped in chocolate, then packaged in a coordinating box of 12. Each box includes: 4 vanilla pops, 4 chocolate pops, & 4 strawberry pops. 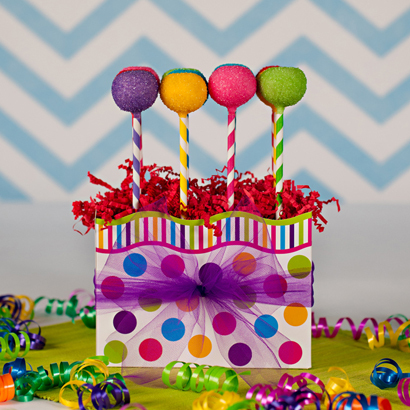 Sugared cake pops are dipped in white chocolate then coated in sugar in a rainbow of colors. Arranged in a festive striped and polka dot box.